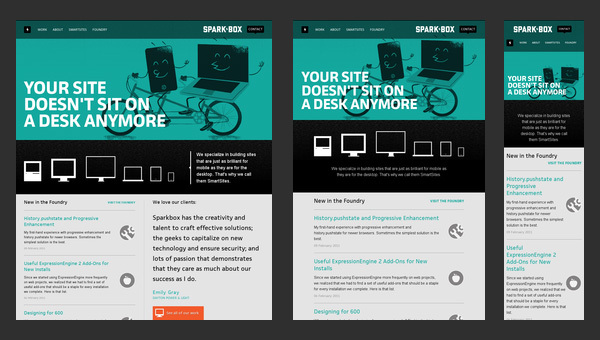 A designer must lead, encourage, and keep the attention of the users when designing for the responsive/mobile Web. A designer can lead a user by including signs or indication to help users know where they are, and how to navigate the website or apps without feeling lost. It helps to encourage a user by adding a reward system that allows a users to obtain what they want, and so they can gloat and show the website or app to their friends and family. A designer can keep the attention and retain users by providing a form of entertainment or by adding the element of surprise or comedy depending on the users, what they find enjoyable, and the nature of the website or app (if it is more of a serious company, you probably don’t want to add games). Screenshot of Texas Roadhouse’s desktop website. Screenshot of Texas Roadhouse’s mobile website.